August might mean the summer’s almost over, but the effort to raise awareness for psoriasis is going strong. 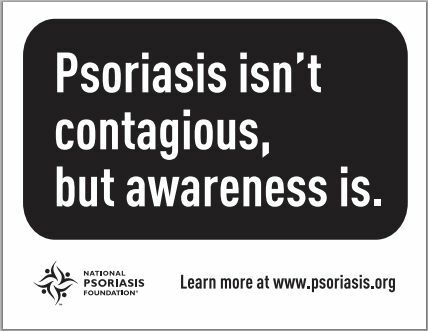 It’s Psoriasis Awareness Month, sponsored by the National Psoriasis Foundation (NPF), and everyone is working to eliminate stigma and dispel the myths surrounding the skin condition. Q: Who is living with psoriasis? A: Over 7 million Americans (equally men and women), and global estimates say 2-3% of the world’s population – as many as 125 million people – has the condition. Q: Can I catch it from someone else? Q: Is all psoriasis the same? A: Nope, there are many different forms of psoriasis, which you can learn about by visiting the NPF’s description page. But these questions just start the conversation about psoriasis, and getting involved is a great way to educate others. Unsure where to begin? The NPF has some great activities, including national Walks to Cure Psoriasis and “More Than Skin Deep” informational events. And if you have psoriasis, you can apply for the NPF’s One-on-One program, where people living with the condition mentor those who’ve been newly diagnosed. Don’t forget to visit the psoriasis community at PatientsLikeMe, too. You’ll see how other members treat their psoriasis, and you’ll be connecting and learning from the people who know what’s its like. Share this post on twitter and help spread the word for Psoriasis Awareness Month.